Clingmans Dome, A Big View in a Short Hike! Short, Sweet, and to the Sky! 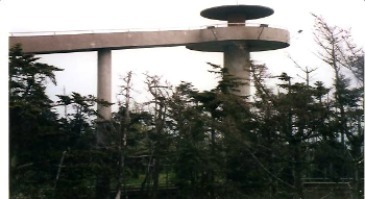 At 6,643', Clingmans Dome is the highest peak in the Smoky Mountains. Thankfully, it's not hard to get there. You might want to go early though. Lots of other people like short hikes and awesome views too! This is a hiking trail that most people can do, but it is a climb. The trail is only 0.5 mile, but you gain 400' in elevation. Up at the observation tower (a paved walkway to get there), you get a 360º view when skies are clear. It's a superb place to catch a sunrise or sunset. When I hiked it, I crossed paths with an English couple from Africa backpacking the Appalachian Trail. This was the highest point along their journey. Those two must have been in their 60s and had packs weighing 40-50 lbs. They were quite an inspiration. Approximate Elevation: Starts at 6200' and ends at 6643'. How to get to the trail: From Newfound Gap Rd. turn on Clingmans Dome Rd. (closed in winter-reopens April 1). Drive 7 miles to parking area at the end. Check Out More Scenic Hikes!